In the internet era, the online examination has become an integral component of online processing and online learning. Student assessment in the online education system is submitted remotely without any face-to-face recognition and interaction. However, student authentication is the significant challenge in online education and examination. This chapter aims to examine various authentication systems, potential threats, and solutions to student authentication in the online examinations and learning. 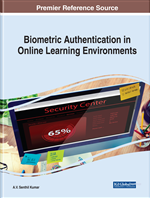 In this chapter, a keystroke-based authentication system is discussed for online examinations. Keystroke-based authentication does not require any additional investments as compared to the other existing authentication approaches such as face recognition, iris recognition, fingerprint, and so on. E-learning systems are becoming one of the largest growing segments of Web-based systems (Shauna Beaudin, Yair Levy, James Parrish and Theon Danet, 2016; Alwi & Fan, 2010). E-learning platform uses a wide range of learning activities such as to meet learning outcomes (Levy, 2008). However, the prevalent uses within academic institutions, e-learning systems are a strategic way for institutions/organizations from various institutions/industries to deliver training to students/employees in order to improve their course content or skills or obtain certifications. In the current scenario, users interact with the e-learning systems through a variety of learning activities. But according to Bailie (Bailie & Jortberg, 2009) e-learning activities can be categorized as formative or summative e-assessments. However, the formative e-assessments are used to identify the gap between current understanding and the desired goal by providing feedback, dialogue, and non-assessed activities. Hence, e-learning systems must ensure that users completing e-learning activities are genuine and secured (Peres, Lima, & Lima, 2014). The Joint Information Systems Committee (JISC) (2006) has defined the e-assessments as, “the end-to-end electronic learning and assessment processes where [Information & Communications Technology] ICT is used for the presentation of learning or assessment activity. A risk to e-learning systems is when users deliberately reveal their authentication details to allow another user to impersonate them (Apampa, Wills, & Argles, 2010). Impersonation is considered the intentional collaboration between users with the intent to commit a fraudulent behavior by the misrepresentation of identity potentially undermining the value of the system (Apampa et al., 2010; Gathuri, Luvanda, & Kamundi, 2014).